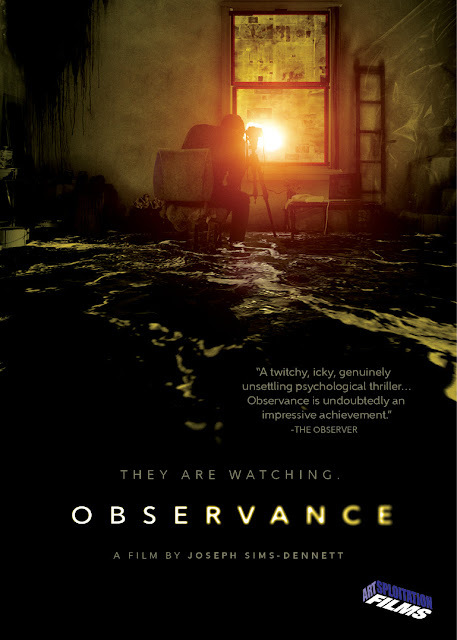 Out now on DVD, Blu-Ray and VOD is horror thriller OBSERVANCE. Atmospherically creepy and visually unnerving, Australia’s Joseph Sims-Dennett’s startling feature film debut follows Parker, a young man in the grip of grief following the death of his young son, his marriage on the rocks and nearing bankruptcy, but who reluctantly returns to work as a private investigator. His assignment is to observe a woman from an abandoned apartment, and as he watches bizarre happenings surrounding her, he slowly becomes aware that the derelict building he is in has a dark presence which slowly threatens to consume him. A frightening horror tale of a man spiraling into madness and reminiscent of Roman Polanski’s THE TENANT, Hitchcock’s REAR WINDOW, and the works of David Cronenberg and David Lynch. Observance from artsploitation on Vimeo.